The 13th annual Feeding Quality Forum in Sioux City, Iowa, offered new insight on a variety of topics, from a detailed market outlook to consumer perceptions of the beef industry. Feedyard managers also shared their ideas on employee management. Producing quality beef and feed sample testing were also discussed. Hear from the speakers, read news coverage and download the presentations below. Victory in war starts long before the battle. The same is true in combat against cattle diseases. “My job as a military commander is to take a soldier and make him resilient,” Col. Sam Barringer said at the Feeding Quality Forum in Sioux City, Iowa this summer. The veterinarian and technical specialist for Diamond V illustrated the point by stretching a rubber band: too much pressure, no matter the reason, may cause it to break. Genetic selection for ranch environment or meeting market demand? That’s a choice cattlemen don’t have to make, said Dan Moser, president of Angus Genetics Inc., speaking at the Feeding Quality Forum in Sioux City, Iowa, this summer. The one thing certain in commodity markets is ambiguity. Ag Resource Company president Dan Basse, however, provided a bit of clarity and foresight at the Certified Angus Beef ® (CAB®) brand’s Feeding Quality Forum in Sioux City, Iowa. When it comes to stocker nutrition, an old-fashioned strategy might be the way of the future. 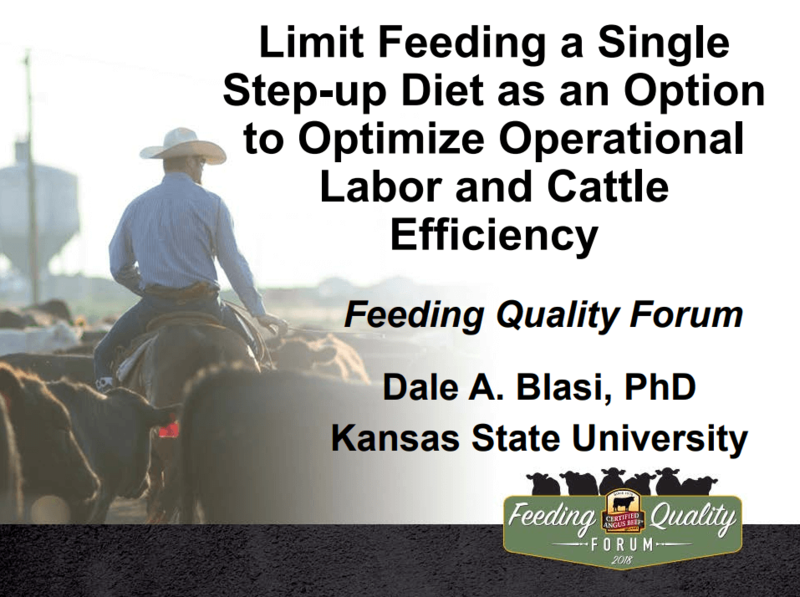 That’s what Dale Blasi, Kansas State University (K-State) Extension beef specialist, said about limit-feeding calves in the growing phase. The scientific research goes back decades, but at this year’s 13th annual Feeding Quality Forum in Sioux City, Iowa, he presented new reasons to give it fresh look. You want a cattle vaccine that’s both safe and effective, but sometimes you have to choose which of those ideals gets the upper hand. That’s according to Paul Walz, the Auburn University veterinarian who spoke at the Feeding Quality Forum late this summer in Sioux City, Iowa. Vaccination programs must be true to the label protocols, yet individualized for each farm or ranch and the level of risk they can accept. It’s a great time to own cows, but only if you have a competitive cost structure with the right genetics and management to compete in today’s marketplace, Rick Funston said. While input costs should be minimized in times like these, “breakeven at best” for many, he said, it won’t pay to compromise fertility in the process. Sometimes it’s easy to see where a person is and forget where they’ve been. It’s easy to stare down the success in the here-and-now, without even a glance at their past. When I learned Gerald Timmerman won our Feeding Quality Forum Industry Achievement Award, I knew the family in generalities…for their feeding businesses spread across Nebraska and surrounding states. I knew they had some ranching and other beef industry interests. Beef packers bridge the gap between producers and consumers, but even “the largest packer in the world” is nothing without its suppliers, John Gerber said. The longtime procurement head for Tyson Fresh Meats set the tone. Every link in the supply chain from ranch to consumer has a role to play. 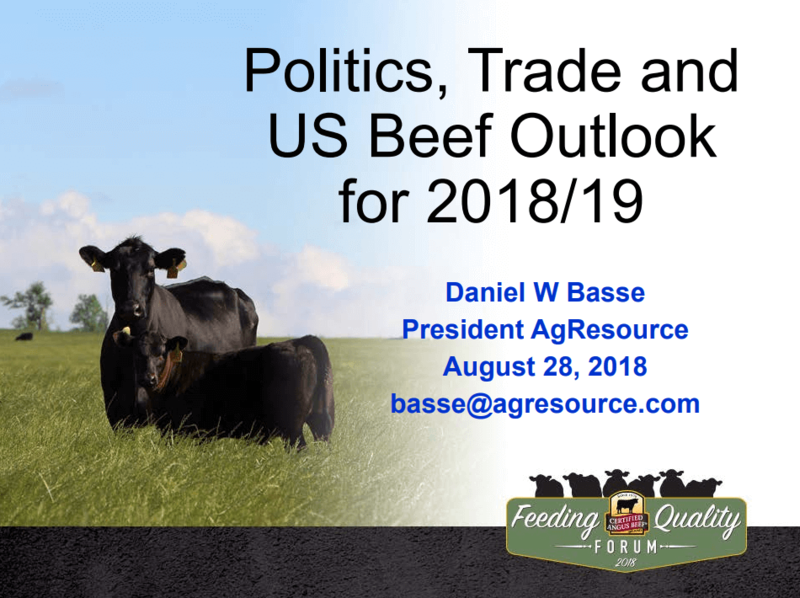 President of AgResource, Dan Basse shared what factors are impacting the cattle markets now and into the future. 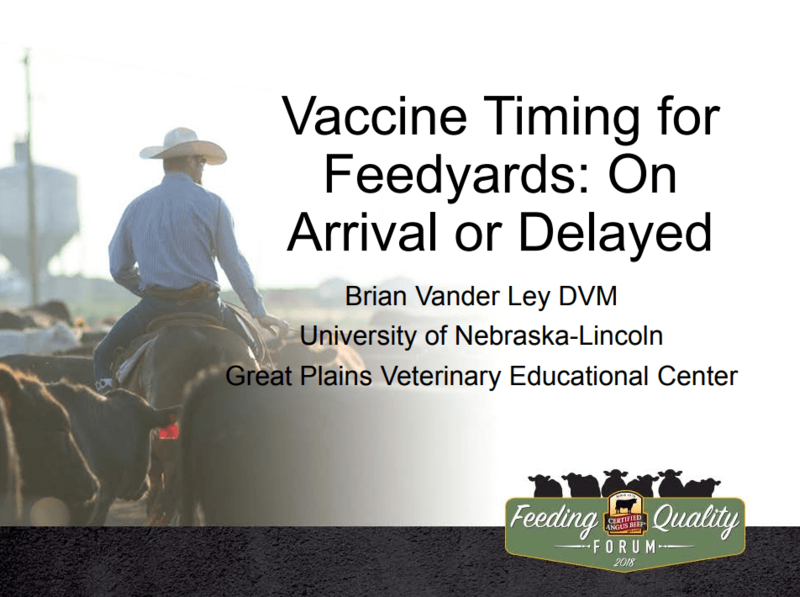 University of Nebraska Lincoln researcher Brian Vander Ley explained the importance of stratigically vaccinating feeder cattle. Kansas State University animal scientist, Dale Blasi shared how to reduce inputs while rising profits. From Auburn University College of Veterinary Medicine, Paul Walz covered the influence of weaning vaccine selection on pre-breeding vaccine options. Beef Technical Services Manager for Micronutrients, USA, Jeff Heldt shares current and future considerations for vitamin and mineral formulations. Grid marketing is nothing new to feeders, but what about the commercial cattleman’s perspective? Paul Dykstra, beef cattle specialist for Certified Angus Beef shares what cow-calf producers need to know. Reproductive Physiologist for the University of Nebraska Lincoln, Rick Funston shares how to create profitable heifer development systems in your operation. Save the date for the 12th annual Feeding Quality Forum August 27-28, 2019, in Amarillo, Texas. Registration will open summer of 2019. Sign up below to receive more information on the event!